Halloween is only a week away! My kids couldn’t be more excited about it. I don’t know if they are more excited to dress up or to get to play in their costumes. 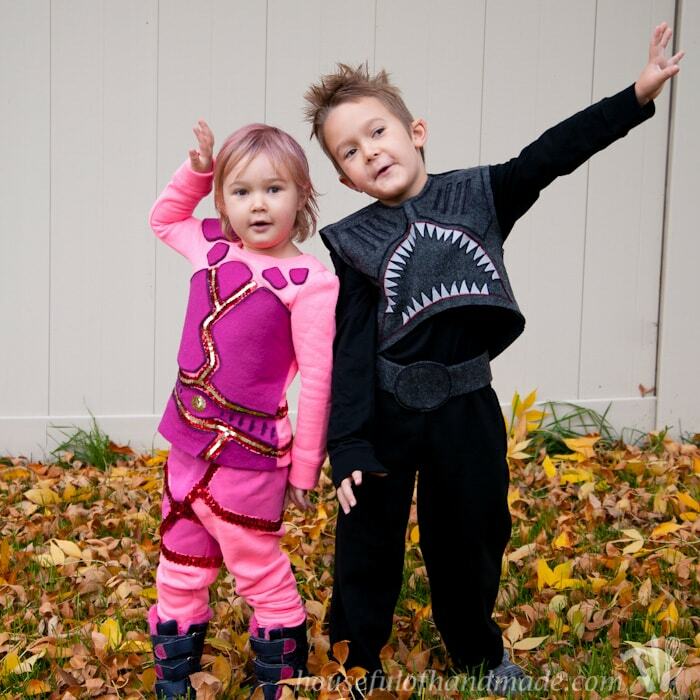 This year, against my recommendations and trying to nudge them in a different direction, my kids decided they really wanted Sharkboy and Lavagirl Halloween costumes. I had never even heard of Sharkboy and Lavagirl until a few months ago when they discovered the movie on Netflix and became instant fans. If you have not seen the movie, don’t bother unless you are under the age of 10. It’s really cheesy, but my kids can’t get enough. So when I couldn’t convince them to pick something else to be for Halloween (I even tried my darnedest to get my 4 year old daughter to be ANY princess), I decided to just go for it and make them the costumes they wanted. 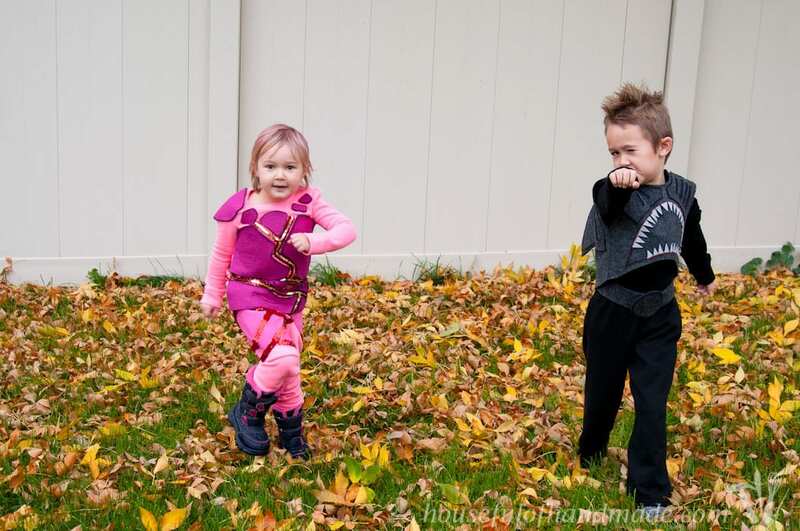 At least the costumes are age appropriate and I knew I could put something together for them. I really like to make our Halloween costumes. There’s just something about a homemade costume, something full of love, and a little frustration, that makes the holiday more fun. But if you are like me, you tend to wait until the last minute to get the Halloween costumes done. I have a plan way ahead of time, buy the supplies a week or so before I actually get started, but then for some reason I like to work under the gun and have to stay up late to get the costumes ready! I guess it’s now a Halloween tradition, and I’d hate to break that tradition so I guess I will continue to complete costumes late the night before we need them. I did however forget to find a hot pink wig for our Lavagirl costume, and since I haven’t had any luck in stores, she will have to wait until Tuesday for the one I found online to get delivered. Oh well, we will still have it in plenty of time for Halloween. And my son is insisting that he needs arm cuffs for his costume, I told him I would try to make some before Halloween. But I think it looks pretty awesome as is! Maybe I’m just tired of this project and ready to move on to the next one (does anyone else do that too?). I’m not going to do a full tutorial on how I made the costumes, but I did take some pictures of the process and can give you some pointers. These techniques I use to make many costumes. I made my husband a Thor costume a couple years ago (still one of my favorites ever) with the same techniques. 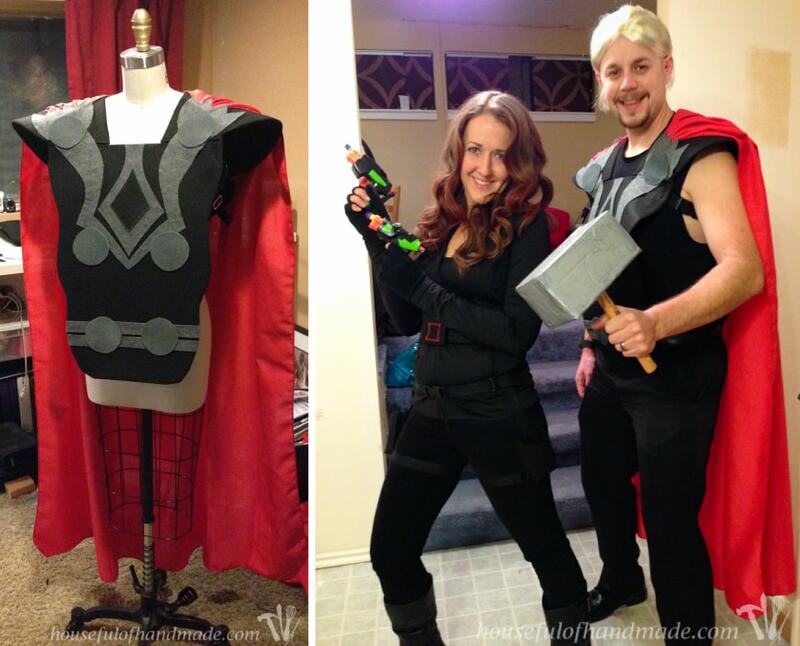 Here is a picture of us in our Avengers costumes, Thor and Black Widow, from a couple years back. Even though I love sewing, I find sometimes it’s easier to skip the traditional sewing for any costume that is not real clothing. These costumes needed extra textures and 3D things coming off them, so I used my Halloween favs of felt, cardboard, hot glue and fabric glue! 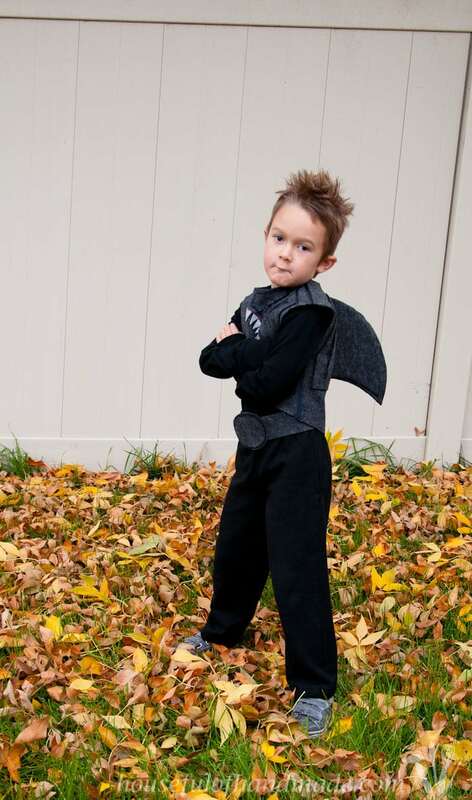 For the Sharkboy costume, I made a shell that can go over a black long sleeve tee. Easy peasy! I love using felt (you can buy it by the yard) to make costumes because it doesn’t have to be hemmed! It saves me so much time, especially when I am layering different cuts of fabric to get 3 dimensional elements to the costume. 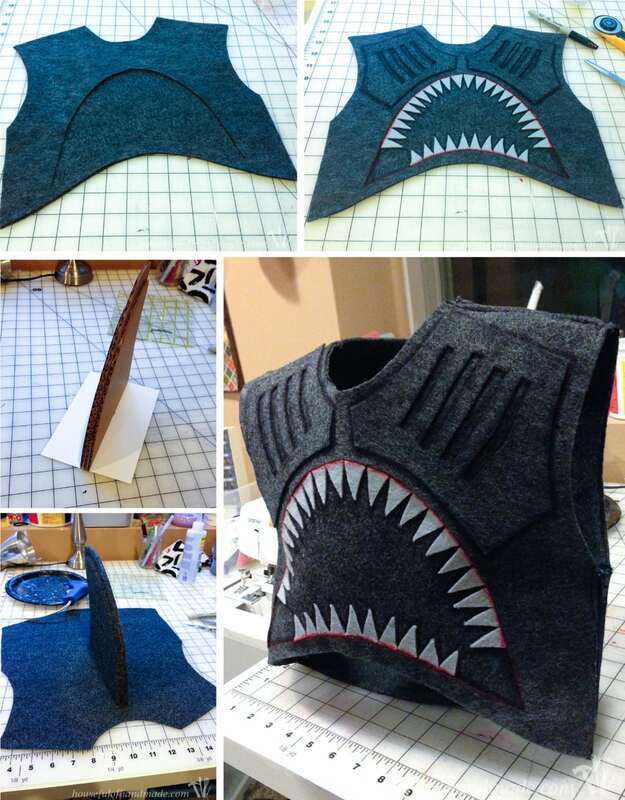 I used 2 layers of felt glued together, the open shark mouth was cut out of the top layer, then I layered design elements on top with another layer of felt. I used fabric glue to attach everything here. To give it more dimension, I used a black sharpie and outlined the design elements. Now they pop and look really awesome. I also used the red sharpie for the detail around the shark mouth. For the fin, I layered 3 pieces of cardboard together, then I glued a piece of extra thick cardstock between the layers so I had something to glue between my two layers on the back of the shell and it is holding the shark fin out perfectly! For the Lavagirl costume, I decided to just glue the pieces of felt on a matching sweatsuit. It’ll help keep her warm in our cool October weather! So I had her put on the sweatsuit and used my fabric marking pen to mark out the general design (referring to a picture on my phone frequently). Then I glued the “lava” down. I chose red sequin ribbon cause they would give me the movement and what girl doesn’t love sequins. I layered the fuchsia felt on top of the gray felt to get a burnt 3D look to the lava pieces. Then I glued them on around the sequins. This layered felt does not stretch at all. The top is a little tight to get on, I may have to add a zipper if she wants this to remain part of her dress-ups, so I choose to just use some fabric paint on the pants (we need to have the stretch and movement in the pants). To make the “lava” really look like it was on fire, I also added a single string of gold sequin ribbon right down the middle. This one was a little harder to make work, especially on a 4 year old’s body, but she is more than happy so I am happy! This year the hubby and I have decided to reuse Halloween costumes from years past since I was running out of time and we couldn’t decide on something for us to dress up as to match the kids costumes. I know we are about to the end of our matching family costume years, so I just need to accept that. But I will continue to try to encourage them to dress up in things that work together. And now the kids are ready to take on all the evils in the world! So now we are officially ready for Halloween, we get to just enjoy the week of festivities! When did Halloween become a week-long event? Between work, school, grandparents, and the birthday party we will have an entire week of Halloween fun! I’m not sure how you did the shark boy teeth could you please help me. Dianne, I cut the teeth out of white felt and glued them to the open shark mouth with fabric glue. Super easy! Question: Did you hand sew them or by machine? I used my machine. If you don’t have a machine, you can hand sew. Did you sew the arms and sides of the felt together or did you just overlap and use fabric glue. 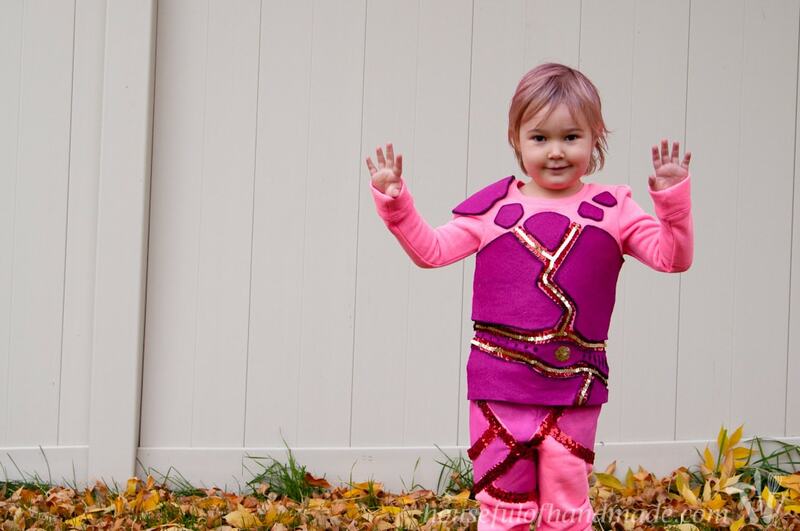 These are super cute and my 6 year old son and 2 year old daughter are going to be shark boy and lava girl this year. 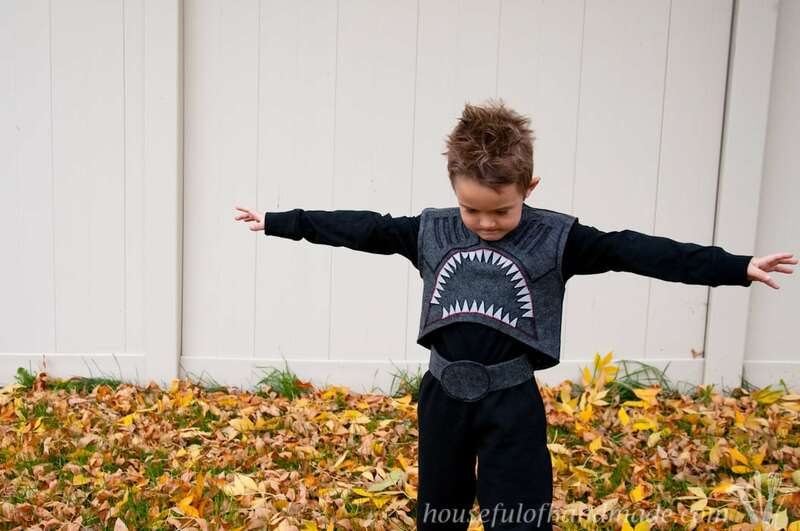 For the shark boy costume I did sew the side seam and shoulder seam on one side and added zippers to the other sides so that he could get it on and off. You could overlap and glue, but my kids are pretty active so I needed it to hold really well. It still looks great a year and a lot of dressing up later. For Lava girl I just glued the felt on top of the shirt to the seam. Now this is super cute! 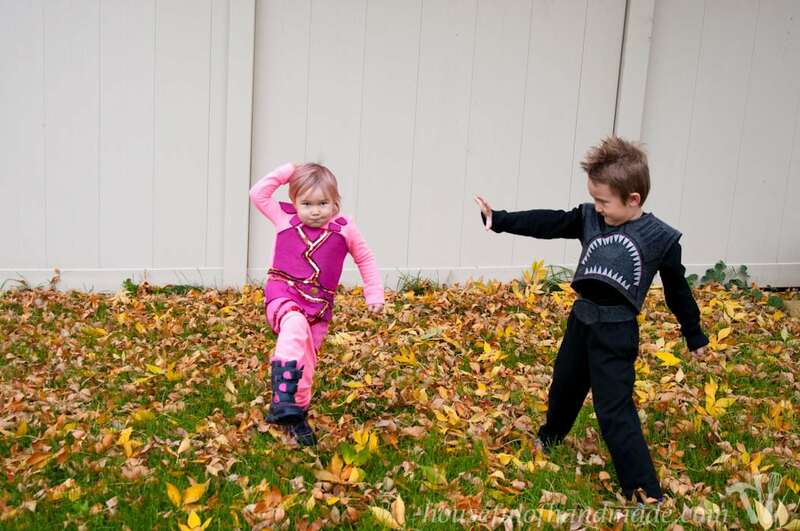 My kids like that movie and what a genius idea to make the characters into Halloween costumes!!! Thanks so much Kathy! They had so much fun playing out the movie in them. super cute costumes! Love all of these – you did a great job! 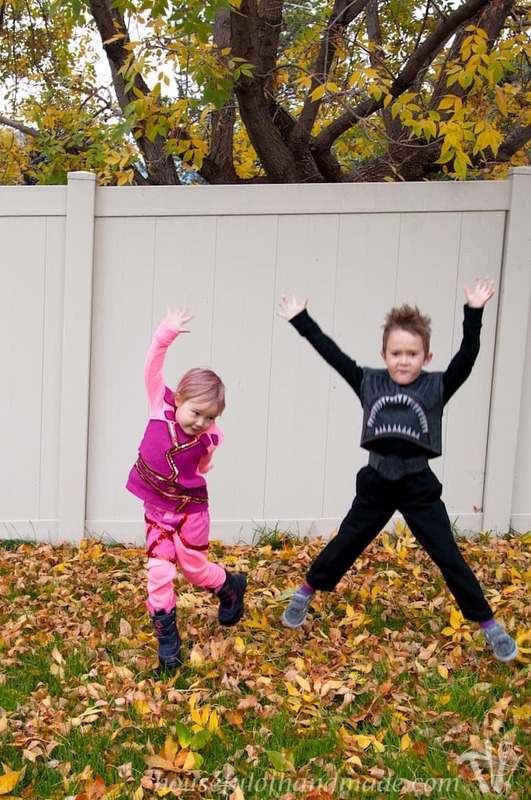 I love these costumes so much, I’m pinning them immediately onto my DIY Halloween board. 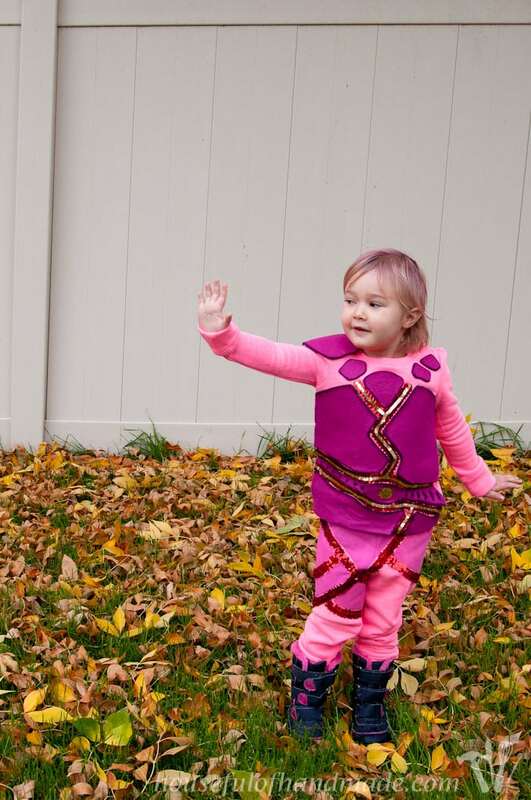 I really like having inspiration for costumes for my daughter in the coming years. Also, Sharkboy & Lavagirl was one of my favorite movies…I can’t believe Taylor Lautner was Sharkboy and now he’s totally different! I came here from the Wednesday Showcase link party…really great getting to link up with awesome bloggers with great projects. My kids used to love playing this game. I had completely forgotten about it. The costumes are really cute! Thanks Heaven! I didn’t know there was a game, my kids just found the movie on Netflix and love to watch it. Fantastic job on all the costumes!! Lovin the pink hair! And I do know who Sharkboy and Lava Girl are! My kids were nuts over them too, years ago. Thanks for linking up to Merry Monday! Sharing on Twitter! Have a great week!